Rich, flavourful, saucy lentils topped with fluffy, creamy mashed potatoes & baked until deliciously golden brown & crispy. The ultimate vegan lentil shepherds pie! Cozy, soup, stew and pie season is nearly over. As the sunshine appears more and more regularly, and summer approaches, I will be mostly changing comforting meals like this Lentil Shepherds Pie up for lighter, fresher offerings like my Tomato Chickpea Salad with Cilantro & Lime and my Loaded Taco Fries. I have been taking advantage of the slight nip in the air and eating my fill of hearty, comfort food before it’s too late. Once summer arrives it becomes unbearable to have the oven on for too long, so dishes like this will take a backseat here on the blog. I won’t promise they will disappear totally though as I am one of those people who can quite happily eat meals like this all year round! 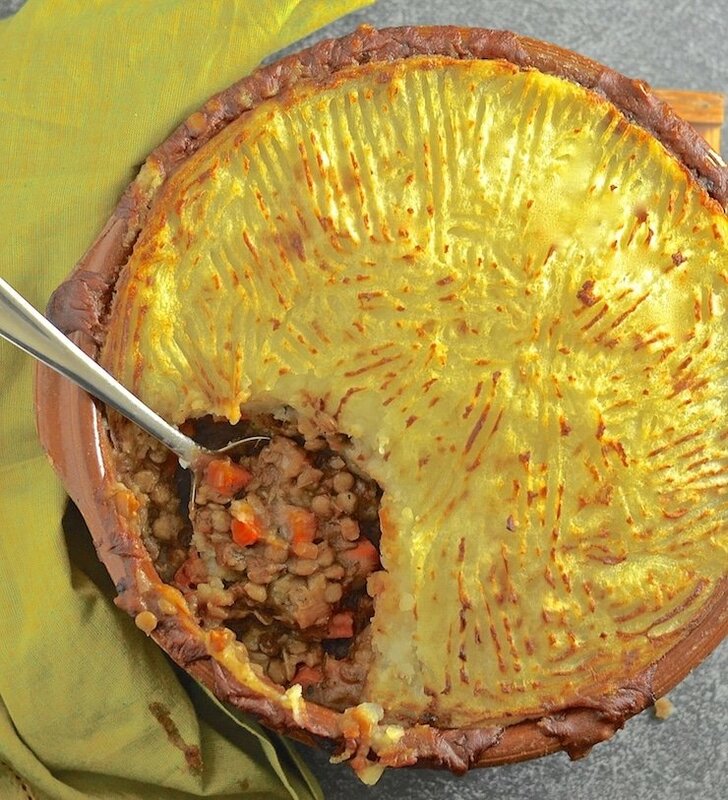 THIS LENTIL SHEPHERDS PIE IS ABSOLUTELY PROTEIN PACKED! 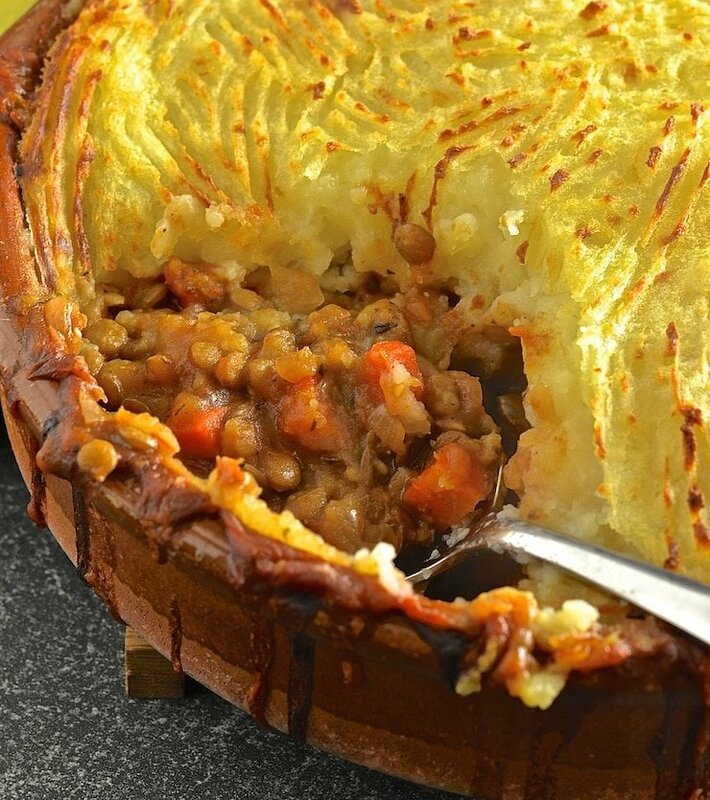 I like to serve this Lentil Shepherds Pie with lots of steamed vegetables. I love cruciferous type vegetables with it the best. We usually end up with a selection of kale, cabbage, Brussels sprouts and cauliflower. The combination of these veggies and the Shepherd’s Pie is just delicious and so nutritious. It is a meal that is absolutely brimming with vitamins, minerals and protein. This Lentil Shepherds Pie is something that I cook very regularly. It is easy, comforting, delicious and full of flavour. I am the only vegan in the house but when I serve this to my family it always goes down incredibly well. What is there not to love about tender, saucy, flavourful lentils topped with light and fluffy mashed potato? Oh how I adore mashed potato. I could eat it by the bowlful and it is especially good with a glug of non-dairy milk and a large knob of my Easy Vegan Butter stirred through it. Now I want to see your pictures of creamy mashed potatoes atop saucy lentils! You can share them via Instagram. Use the #avirtualvegan so I don’t miss them. Oh and if you somehow end up with leftovers (we haven’t as yet! ), you can keep them in the fridge for a few days. They reheat very well. Rich, flavourful, saucy lentils topped with fluffy, creamy mashed potatoes & baked until deliciously golden brown & crispy. 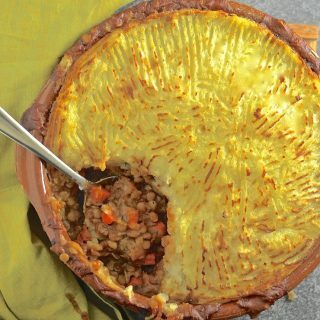 The ultimate vegan shepherd’s pie! 1 knob vegan butter ,(optional) add as much or little as you like. I usually add a couple of tablespoons. Put the diced potatoes in a large pan and cover with hot water from the kettle. Add a generous pinch of salt, cover and bring to the boil. Simmer for about 15 minutes until the potatoes are very tender (check with a fork or knife). Drain then return to the pan, add the milk and butter (optional) and mash very well. Set aside. While the potatoes are cooking warm another pan over a medium heat. Saute the onions, garlic and carrot until the onions are starting to go golden brown. You can use oil if you like but I just used a drop of water instead. Add the dried herbs, lentils and arrowroot or cornstarch. Stir well to distribute the arrowroot through the lentil mixture. Add the Tamari and tomatoes and stir very well. Add the stock and stir well again. As soon as hot and starting to bubble remove from the heat. Pour the lentil mixture into an ovenproof dish that isn't too deep. Spread it around evenly then rough up the top with a fork. Place on a baking sheet in case of any leaks and bake in the oven for 30 minutes. If you want an extra crispy topping you can then put it under the broiler for a few minutes before serving. Try to get a nice seal around the edge where the potato meets your dish but don't worry too much as it will inevitably spring a leak and bubble out somewhere. I think this adds to it's appeal!